There’s a joke between me and Brian about his training habits. If it’s a Saturday, he’s probably running the Seven Sisters. If it’s a Sunday, he’s probably running the Seven Sisters. If it’s a holiday, day off from work or even one of his every-other Fridays off, he’s probably running the Seven Sisters. He would run there every day if he could. So, when I ask him where he’s running today, it’s a rhetorical question, of course he’s running the Seven Sisters. The Seven Sisters sits in southern Amherst, MA, running the ridge of the Holyoke Range. The trail itself is 6 miles long (so doing the out-and-back makes for a 12-mile run) with 3,700 feet of climbing for the out-and-back. It’s rocky and technical, similar to many Beast Coast trails that we enjoy. There aren’t many views along the way, but when you do catch a vista, it’s often of downtown Amherst (featuring the buildings of UMass Amherst, Amherst College and Hampshire College), the winding Connecticut River that cuts at path through western Mass, and the mill buildings of nearby Easthampton. In the distance, you can catch glimpses of Mt. Greylock to the west and the Green Mountains of Vermont to the north. 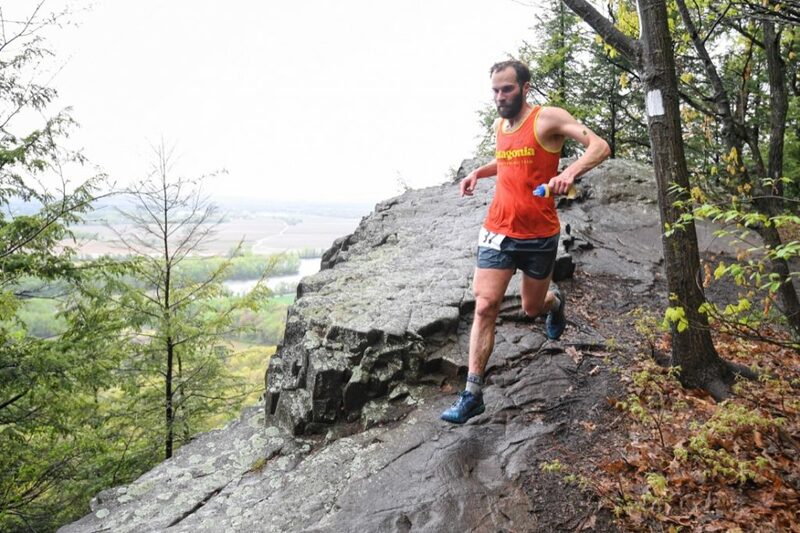 Running the Seven Sisters is hard and slow, only about a dozen guys ever can boast running the trail in under 1:50, and many big names have run the Seven Sisters Trail over the years at the annual trail race held there. Nikki Kimball holds the women’s course record at two hours. If you do the math on that, it means that no woman has even run these 12 miles faster than 10-minute per mile pace. It’s the sort of iconic Beast Coast trail that us Beast Coasters love, where you are climbing hand-on-knee uphill for a few minutes before dancing over rocks on the next short downhill only to repeat over and over and over again. There is often much debate amongst runners as to which high points are the actual seven “sisters,” since it seems that there are dozens of potential “sisters” along the route. More than trying to win, one of the most coveted prizes at the trail race is the “Best Blood Award” as there are often some gnarly injuries that come with trying to run the Seven Sisters fast. A few years ago, the best blood winner had gotten several stitches in his cheek, literally face planting on-course. Beyond appreciating this trail for its challenge (and proximity to my house), I have a much deeper connection to the Seven Sisters. Back in 2009, I was a relatively new ultrarunner and signed up for the Seven Sisters Trail Race as part of the build-up for my first 100-mile race that summer. I had an amazing day, knocking 35 minutes off my fastest time and surprised myself, and everyone else, by crossing the finish line as first female. It was the first time that I had won a trail race. Heck, it was the first time that I had won anything other than some local 5ks back in high school. Interestingly, the surprise winner on the men’s side was Brian Rusiecki, who was also a relatively new ultrarunner and a relative unknown runner at the time. It was also Brian’s first race win, and he was as surprised as anyone to have beaten Leigh Schmitt and Ben Nephew in what was one of the fastest year to-date (these three guys all went under 1:50). At the time, Brian was nothing more than a fellow runner that I had shared some miles (and maybe a few drinks) with and who I had a crush on. Emboldened by my big race win, I invited Brian to come out and have some drinks a few nights later with a few friends to celebrate Cinco de Mayo. That was the night that Brian finally kissed me, perhaps similarly emboldened by his big race win. Nearly a decade later, we still feel that the Seven Sisters Trail brought us together and it holds a special place in our heart. I now direct the Seven Sisters Trail Race, which maintains our connection to the trail and the event that brought us together. I try to get out to the Seven Sisters when I can, but it’s slow and challenging miles so it’s easy to opt for an easier trail with quicker miles. I was extremely proud of myself for running it three times in a week once (plus doing a Pemi Loop that week) in my build-up to UTMB a few years ago. The years that I get out on the Seven Sisters regularly are the years that I feel my strongest and have my best races. Brian likely has the record for running the Seven Sisters more than anyone else. And if you want to know where to find him on a Saturday, Sunday or every-other Friday, head out on the Seven Sisters and you’re sure to cross paths with him. This race was started by one of the founders of Ultrarunning mag., Fred Pilon….